We are located in the heart of the city, within walking distance to Toronto's Entertainment District, Financial District, various shopping areas and sporting venues with easy access to the PATH system and transit systems. University Ave. & Dundas St. The UP Express train is located in Terminal 1 directly adjacent to the Link Train service connecting Terminals 1 & 3. The train leaves from Pearson Station going to Union Station downtown every 15 mins. The ride takes 25 mins. Once at Union Station, switch to the subway and go north to St. Patrick station. Exit to the street and walk half a block south to the University Club front door. The club does not have parking but there are many options close-by for members and guests. Please see map below. 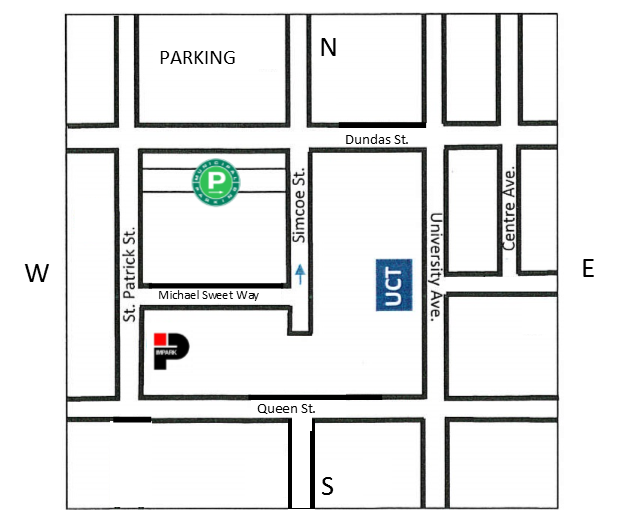 Impark lot at 56 St. Patrick St.
Green P lot at 121 St. Patrick St.
Metered street parking on Simcoe St. behind the club.